A lot has happened in the past four years. Louis and Harry got married and officially became the Stylinson family. 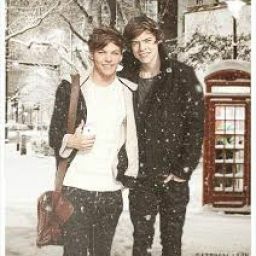 They both finished school online and Louis continued on to Uni where he got a teaching degree and now works as a drama teacher at the secondary school. Harry wanted to focus on the boys so he never went to Uni, he works weekends as a receptionist at a children&apos;s hospital. Both he and Louis are fluent in sign language as well as their still close friends Zayn, Liam, Perrie and Jade. Zayn and Liam got married a few months ago and are enjoying the newlywed life where as Perrie and Jade got married soon after Harry and Louis and are focused on doing their best to raise their now four year old, Sabrina. Ashton and Niall Stylinson have just turned four years old and are starting nursery. Both boys can run and play but it&apos;s clear Niall is behind Ashton in many ways. Ashton can talk, Niall can&apos;t. They&apos;re teaching both boys sign language but it&apos;s not easy to learn, especially for two boys with a one second attention span. Thankfully Niall is fluent because they focused more on him but they&apos;re worried that the twins will grow up apart unless they find a way for them to communicate. Ashton is potty trained, Niall isn&apos;t. Harry and Louis spent so much time teaching him sign language that they have still yet to get to potty training and even worse is Niall shows no interest. Ashton is outgoing and Niall isn&apos;t. He&apos;s used to people giving Ashton more attention since he&apos;s easy to communicate with which resulted in Niall ceasing to even try anymore. It&apos;s hard to get him to communicate with anyone who doesn&apos;t know sign language, including Ashton sometimes. Okay so there&apos;s the description. I hope you guys will like this book and I will accept prompts for it.